Latin America’s biggest banana producers have joined forces to condemn plans by German retailer Aldi to cut the price it pays for its bananas. Leaders from the Costa Rican, Colombian and Ecuadorean banana industries met with Ecuadorean Agriculture Minister Xavier Lazo in Guayaquil on Wednesday to discuss the creation of a common front to oppose Aldi’s reported plans to cut its price by €0.60 from 2019. The meeting followed the publication of an open letter last week by 32 Ecuadorean industry associations and producer organisations accusing the German retailer of undermining their efforts to improve the lives of workers and protect the environment. “We cannot under any circumstances allow Aldi to reduce its price as it would affect the entire banana production chain,” said Eduardo Ledesma, president of the Association of Banana Exporters of Ecuador (AEBE). Lazo indicated at Wednesday’s meeting that Latin America would seek to adopt a common position before the end of this week. Jorge Sauma, general manager of Costa Rican banana association Corbana, warned that Aldi’s move would “directly affect producers and reduce the possibility of maintaining current social and environmental standards on farms”. 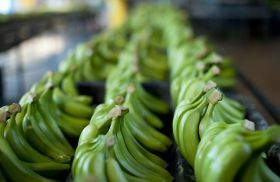 Around 75 per cent of the bananas sold in Europe come from Latin America so any moves to disrupt supply could have serious implications for the market. Colombian associations Augura and Sintrainagro said the commercial decisions taken by retailers willfully ignored the importance of banana prices in maintaining economic stability in one of the region's most important sectors. "We are sure that the final consumer does not know and probably would not support a commercial policy that annuls the innumerable efforts made by producers in the countries of origin to supply them with high quality fruit, produced with social equity and environmental responsibility," they said. The Association of Independent Banana Producers in Guatemala (APIB) added its voice to the cause on Thursday, issuing a statement condeming the European and US retailers' race to the bottom on banana prices. "The world needs urgent changes in breaking old paradigms, such as low prices for bananas," APIB said. Wednesday’s meeting was also attended by Juan Camilo Restrepo, president of Colombian Banana Association Augura; Jorge Sauma, general manager of the Banana Corporation of Costa Rica (Corbana); and representatives from Ecuador's biggest exporters.